Do we laugh or are we missing something? 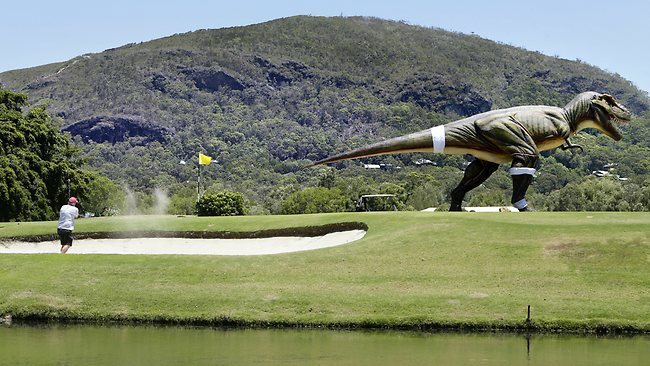 Maybe it's just me but I’m not sure of the Sunshine Coast Council’s decision yesterday allowing Clive Palmer to build a dinosaur theme park , I can understand a vintage car museum but trying to hole a 3 foot putt with a life size T-Rex breathing down your neck is going a bit too far. ECCENTRIC mining magnate Clive Palmer has been given the green light to build "the world's biggest" park of giant robotic dinosaurs, despite hundreds of objections filed by local residents. A spokeswoman for the Sunshine Coast Regional Council said Palmer's plan to erect up to 160 animatronic dinosaurs at his Coolum Resort was approved "unanimously by council this morning", with local officials hoping for a tourism boost.